DD3 wanted to really dress up for October 31st this year, which isn’t a big holiday in this house, but what do you say to school peer pressure? Especially if sewing something fun like a costume is involved, right? After much research through Mommy’s Pattern Stash, she chose an ensemble from Burda’s January 2013 carnival collection. It’s actually a set of patterns to mimic clothing from Star Wars, but there’s no mention of Star Wars, probably for copyright reasons. I frankenpatterned the little white Leia costume in the bottom right corner of the photo for DD2 last year. 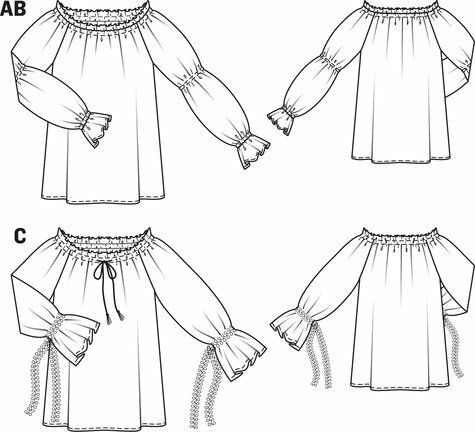 The Galactic Princess costume consists of this Fairy Tale Blouse (Burda 1/2013 #118) with an overdress (post on overdress to follow later). 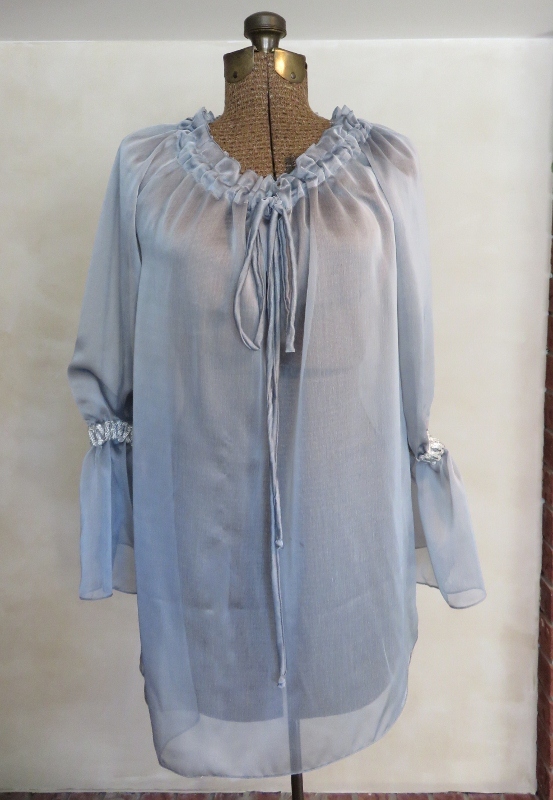 The blouse is very straight forward to sew; it’s only three pieces. And due to it’s loose fit, no fitting required. How lovely is that! I made a few changes to the instructions. First, I made the ties from a long strip of bias fabric instead of purchased cord. It doesn’t look like much in these pictures, but in the context of the costume, I thought the self-fabric tie would be a better choice than yet another texture thrown into the mix. Second, I did not leave the edges raw. 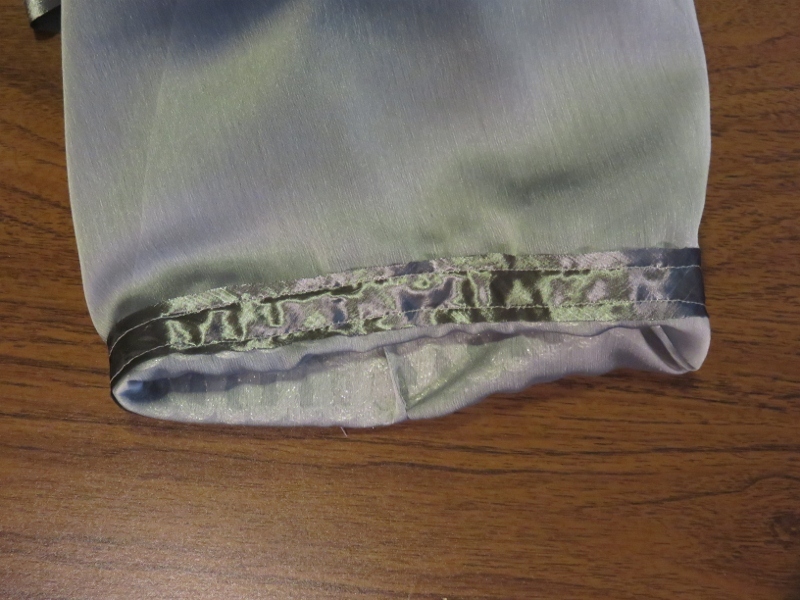 I hauled out my overlocker (serger) and did a rolled hem on the neckline, sleeves and bottom edge. 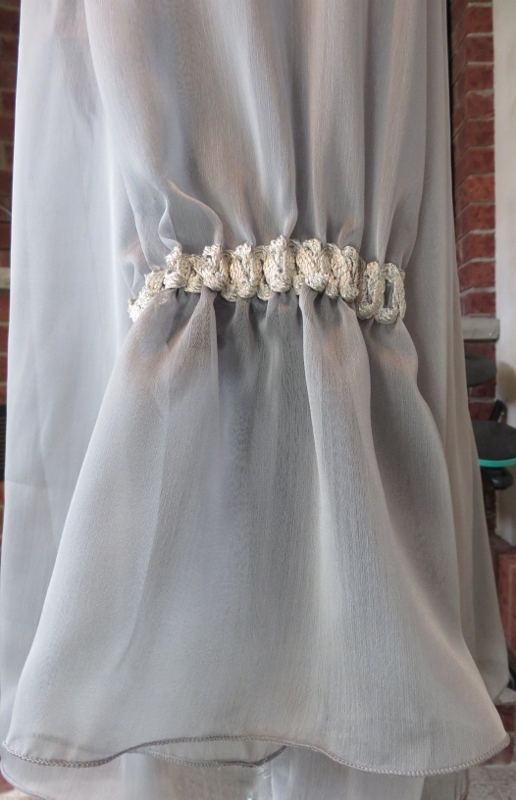 And I used French seams for the construction. And third, I decided the looooooong trails of trim tied loosely around some nebulous wrist area of the arm as per Burda was ridiculous for an 11-year-old, especially since she will be wearing this to school and she’ll need to be working, not untangling herself from yards of trim trailing from her sleeves. So I stitched the trim down on each edge, which left me a channel about 5/8″ wide. 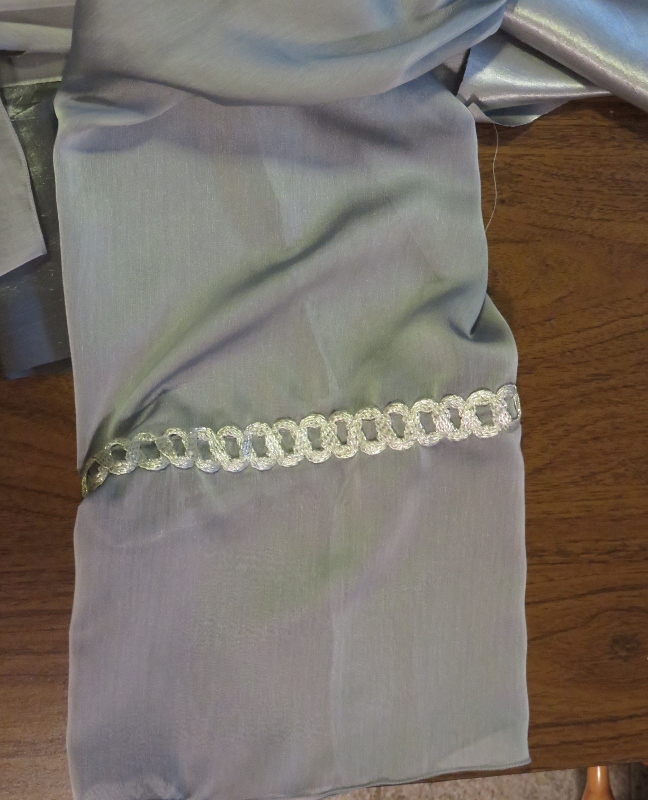 I backed it with bias taffeta strips (no edge finishing required) and ran an elastic through the casing. Et voilà! Nicely gathered sleeves that won’t drag through school work. < Previous Tag: You’re It! Good for you going for that costume-making. My guy’s 13 so we went with a RTW costume for the first time in a long time. I’m going to have to start doing cosplay because he’s getting too big for trick-or-treat! I think cosplay opens an entire world of doors with so much more sewing fun to be had than mere trick-or-treat costumes.